CHICAGO (WLS) -- ABC 7's Emmy Award-winning "The Ñ Beat," aired Saturday, March 25 at 6:00 p.m. Hosted by Stacey Baca with special contributions by ABC 7's Tanja Babich, Rob Elgas, Michelle Gallardo, John Garcia and Roz Varon, THE Ñ BEAT is a rich tapestry of stories highlighting the contributions of Chicago's vibrant Latino community. The half-hour program covers everything from business to education to food and the arts. Baca hosts this edition of the THE Ñ BEAT from 'The Miracle Center,' a Logan Square theatre and arts center, Saturday, March 25 at 6:00 pm with an encore presentation on Saturday, April 1 at 4:30 pm and Sunday, April 9 at 4:30 pm. 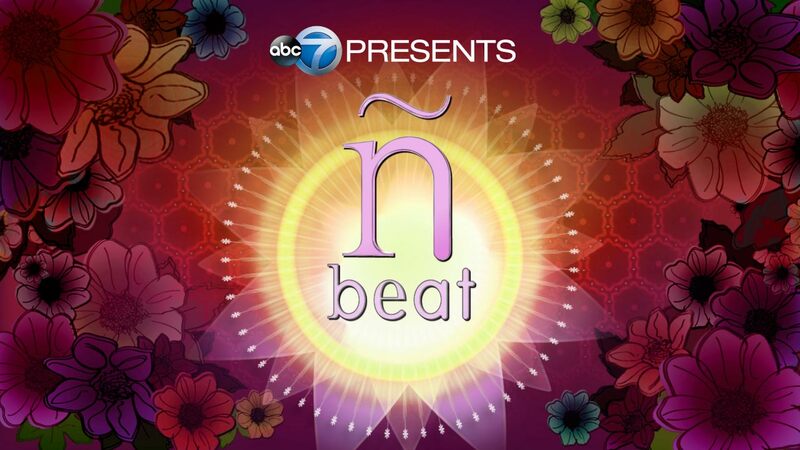 THE Ñ BEAT is an Emmy Award winning series of special programs produced by ABC 7 Chicago. What began as a search for something to sell at a school crafts fair turned into a big business for one pre-teen from Mundelein, Illinois. This edition of THE Ñ BEAT profiles Felix Castillo's entrepreneurial spirit as he and his co-CEO mother grew their bakery from a small, home kitchen-based operation to a successful company with its own production facility. Felix's Famous Cookies includes a variety of Polvorones or sugary shortbread cookies that can be purchased online and at locations around Chicagoland. She grew up in Miami and later Angelina Bastidas earned the distinction of becoming one of Top Chef's youngest competitors. She is now one of Bucktown's newest executive chefs. THE Ñ BEAT explores Angelina Bastidas' road to success and how she is bringing a new and fresh twist to AMK Kitchen Bar's classic comfort food. Next, THE Ñ BEAT visits Lincolnshire's 'Marriott Theatre' to catch up with actress, Lillian Castillo. Born in Puerto Rico, Castillo lived in Utah and on the East Coast before finding a home in the Chicago theatre community. Castillo is currently performing as Lisa in the Marriott Theatre's production of Mamma Mia! Castillo isn't the only talent currently in rehearsals for a show. The talented student-performers at 'The Miracle Center' are in the midst of preparations for their late spring production of Hairspray Jr. 'The Miracle Center' started as a summer camp based out of founder, Mary Santana's, basement. Since those early days, it has grown into a thriving organization providing year-round theatre and arts programs to children and families from across Chicago. This half-hour special profiles Claudia Castro, the head of the Chicago Hispanic Lawyers Association of Illinois. Latinos remain one of the fastest growing groups in the U.S. yet, they account for only four percent of the nation's attorneys. And when it comes to 'Latinas' in the ranks of U.S. lawyers, that number shrinks to a dismal 1-percent! But Castro defied some enormous odds to earn her way into that elite circle and she's working hard to see that others do the same! Since opening its doors in 1870, Chicago's Erie House has been educating and empowering members of numerous Chicago communities through after-school and educational programming that services the whole family. Felix's Famous Cookies was started by 12 year-old Felix Castillo, of Mundelein. What began as a search for something to sell at a school arts and crafts fair has turned into big business for a Mundelein boy. 12 year-old Felix Castillo and his mother Laura are co-CEOs of Felix's Famous Cookies. They sell several different varieties of Polvorones... or sugary shortbread cookies. Their company has grown so much in just two years that they went from their home kitchen, to a shared kitchen, to their own Mundelein production facility. Just as important as growing the business is 'giving back'... Felix's Famous Cookies donates 10% of their proceeds to local charities. They sell their cookies online. Chef Angelina Bastidas, a former Top Chef contestant, turns up the heat in Bucktown's AMK Kitchen Bar. At 26 years old, Angelina Bastidas knows what it takes to prepare a gourmet dish having been cooking since she was 8 years old. Now, this former Top Chef contestant is looking to break into Chicago's culinary scene after moving here from Miami. Just last year, Bucktown's AMK Kitchen Bar reached out to this Bronx native hoping she could turn up the heat in the kitchen. Actress Lillian Castillo, who was born in Puerto Rico, performs in "Mamma Mia" now playing at the Marriott Theatre in Lincolnshire. Actress Lillian Castillo was born in Puerto Rico but relocated to Utah at the age of 11. It was there in Utah that this timid girl developed a love for singing. What started out as her simply chanting in school, has now turned into a career of all sorts for this talented woman who now calls Chicago home. Today, Lillian can be found on stages across the Chicagoland area performing in a variety of productions. Presently , she is a member in the cast of "Mamma Mia" now playing at the Marriott Theatre in Lincolnshire. Logan Square's The Miracle Center brings theater to youth in Chicago. Located in Logan Square, The Miracle Center was founded twenty one years ago by working mom Mary Santana who was simply looking for a way to engage youth during the summertime. Today, this arts and mentoring program employs and trains young people interested in theatrical arts & film. Over the years, the program has evolved to offer year round programming to young people in the Chicagoland area. A few times a year, they have a performance where the children take charge of all areas of production. In May, The Miracle Center will be performing Hairspray Jr. The Erie House has been impacting the lives of Latino families for more than 140 years. Erie House has been impacting the lives of Latino families for more than 140 years. And with their 100% high school graduation rate and 98% college acceptance, they are helping to make the future brighter for thousands of kids. Evergreen Park attorney Claudia Castro leads the Hispanic Lawyers Association of Illinois.